For millions of families the Sandman is part of their daily evening ritual. And still, there's not a bit of nostalgia: The Sandman is up to date! From now on he isn't just ready for action around the clock over the Internet and via App. Thanks to the new Smart TV-implementation the Sandman sprinkles his dreamsand also in TV on demand. And even more, next to the current Sandman episode three additional videos are available. Fraunhofer FOKUS scientists supported the technical development with their modular system for HbbTV (Hybrid broadcast broadband TV)-applications, the HbbTV Application Creation Toolkit. A click on the red button on the remote control leads to the program-accompanying HbbTV-offers of rbb. Another click on “ok” and the Sandman appears on the screen. The viewer can easily choose between the videos with the navigation over the arrow keys of the remote control. 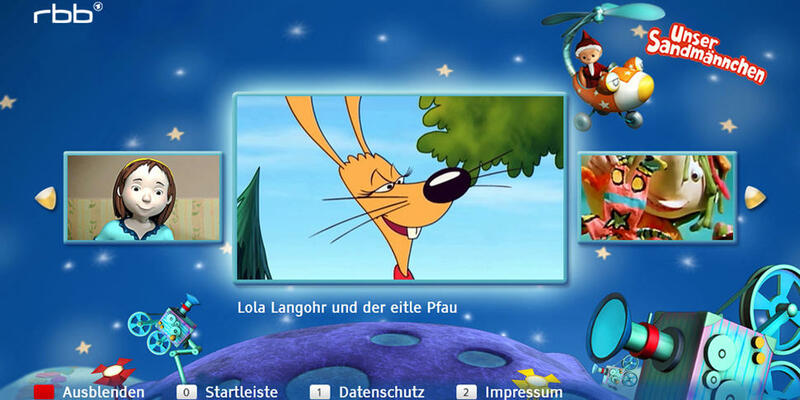 The only requirement is an internet-connected TV (Smart TV) that makes HbbTV-services as e.g. the broadcasters media library retrievable. The HbbTV-implementation for the Sandman has been developed by rbb in cooperation with the Institut für Rundfunktechnik (IRT) and Fraunhofer FOKUS as part of the European research project “Future Internet Content 2”. With the “HbbTV Application Creation Toolkit” the FOKUS scientists first created fitting templates and suited them to the corporate design of rbb. Afterwards they designed and integrated a videogallery-module. Soon, editors can create these HbbTV-applications themselves – without any technical skills. In addition to the videogallery, other modules such as photogalleries, text blocks and social-media-tools are provided. The app-toolkit is open source and can not only be used by broadcasters but also multimedia-agencies and TV app developers. On request, Fraunhofer FOKUS implements individual further developments.